Note all tractors have several seat choices, and when buying cushions they must match the seat. 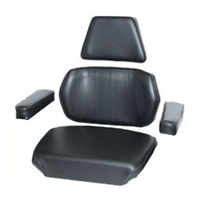 Quality replacement seat assembly for your Case tractor with Comfort King 30 series 3-pc seat. Seat cushion, large backrest and small backrest have steel backing. Seat has 4" foam cushion. Large backrest and small backrest have 2" foam cushions. Seat assembly tips forward. Hardware includes two side plates and one back plate. Seat bottom has multiple bolt patterns.